Be Inspired! Looking for inspiration and practical advice to help your writing? 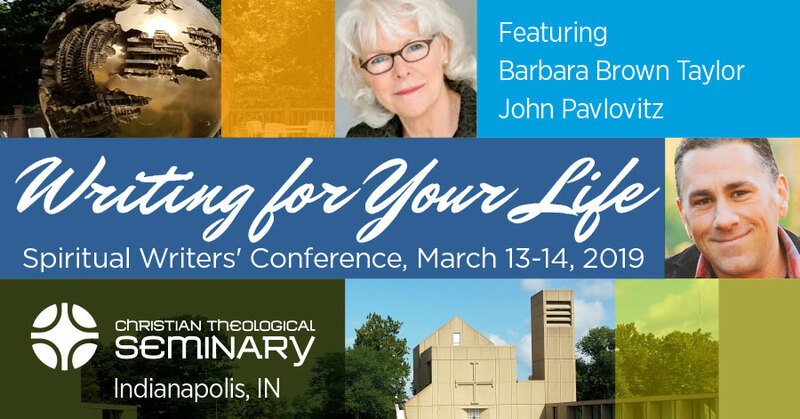 Writing for Your Life and the Christian Theological Seminary welcome you to Indianapolis for our next Spiritual Writers’ Conference! The conference is open to all who are interested in spiritual writing. This conference focuses on inspiration and craft for spiritual writing, with some “how to get published” thrown in. It includes popular Christian authors and representatives from the Christian publishing industry. The main conference will take place on March 13-14, 2019, with an optional pre-conference DigDeeper Retreat on March 12 (separate registration required). The conference and retreat will take place at St. Luke’s United Methodist Church located at 100 W. 86th Street in Indianapolis. Headline speakers for the event are authors Barbara Brown Taylor and John Pavlovitz. Leading our DigDeeper Retreat and two conference breakout sessions will be author Philip Gulley. Additional breakout sessions feature: Rev. Dr. Frank A. Thomas (author, preacher, and seminary professor), Erin Healy (author and freelance editor), Sophfronia Scott (author), Jessica Mesman (author), Susan Salley (Associate Publisher, Abingdon Press), Tony Jones (author and former Senior Editor, Fortress Press), Mary Benard (Editorial Director, Skinner House Books), Nathan Day Wilson (columnist with The Indianapolis Star and pastor), and Brian Allain (owner of Writing for Your Life, who will speak about self/indie publishing). You can learn more about each speaker through the links below. Regular price registration is $329 for the main conference and includes all General Sessions and Breakout Seminars, refreshments, 1-on-1 or small group meetings, and an open-mic session. Registration Now Open! Click on this link to pay now (credit card, debit card, PayPal, or PayPal Credit are accepted; all payments are processed through PayPal). After you pay, you will be redirected to another page to complete your registration. After you complete your registration, you will be sent an email confirmation within 48 hours. Registration Now Open! Click on this link to pay now (credit card, debit card, PayPal, or PayPal Credit are accepted; all payments are processed through PayPal). After you pay, you will be redirected to another page to complete your registration.